Drain cleaner takes care of some blocked drains but not always. If you’ve exhausted every method you’re comfortable with and still have a nasty blocked drain, call in a professional drain specialist plumber in Horsham for your blocked drain problems. A qualified plumber will have the tools and experience to clear out the worst blocked drains. Burst pipes are easily found, but small leaks often hide between walls or in crawl spaces. Leaks can cost a lot of money in water bills over time. Homeowners often try to remedy leaks by applying tape or glue. Unfortunately, this does not fix the problem for long. Burst pipes constitute a plumbing emergency and must be dealt with immediately. Sewage problems range in severity from a simple blocked toilet to broken pipes beneath the home. This is not a job for a do it yourself homeowner. Call a plumber instead of trying to take on this job on your own. You may only make the problem worse if you attempt fixing it on your own. Open, crumbling or damaged manholes or broken gully grates are a public hazard and if you discover one it is vital that you contact a specialist drain repair company to handle the situation. DrainBoss provide comprehensive repair to all damaged manhole covers and gully gratings. We will provide an initial thorough site inspection diagnosing the causes of the problem and provide a remedial solution. We will then provide you with an estimate for the work. For more information on manhole cover and gully grate repairs, call a DrainBoss team member today on 01403 597789. Septic tanks fill up and have to be pumped from time to time. This is absolutely not something a homeowner can do. You must call a professional septic tank emptying service for septic tank pumping. Homeowners sometimes mistake a full septic tank for a blocked toilet. Several attempts at unblocking the toilet result in a lot of frustration and a call for a professional. Once the problem is discovered, it is a relatively quick fix. DrainBoss provide a full septic tank emptying service in the Horsham area and we also carry out septic tank maintenance and repair. Find a qualified emergency plumber in Horsham for your blocked drains and other plumbing emergencies. 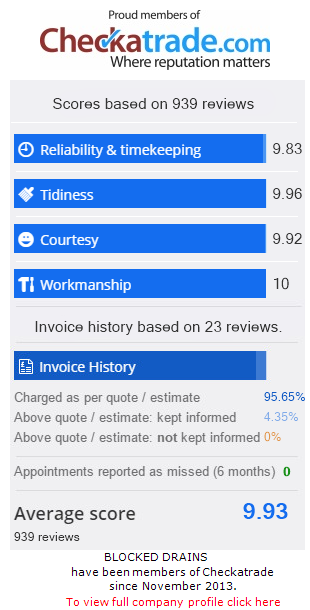 DrainBoss Plumbing and Drainage is Trading Standards Approved with great reviews at Checkatrade.com If you’re looking for a qualified plumber who specializes in drain unblocking with good reviews in London, Crawley, Brighton, Croydon, or Horsham, call us on 01403 597789. Ask about our special internet offer when you call. We offer 5% off of every order when you use the code DB2301.